We lay it out, for you to play it out. Canyoning or “canyoneering” in America is all about making your way through a canyon using various techniques. 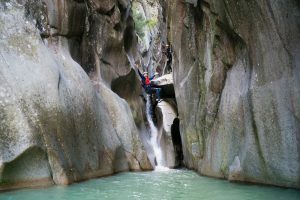 However, different canyons require different skills such as walking, scrambling, climbing, jumping, abseiling or “rappelling”, and swimming. 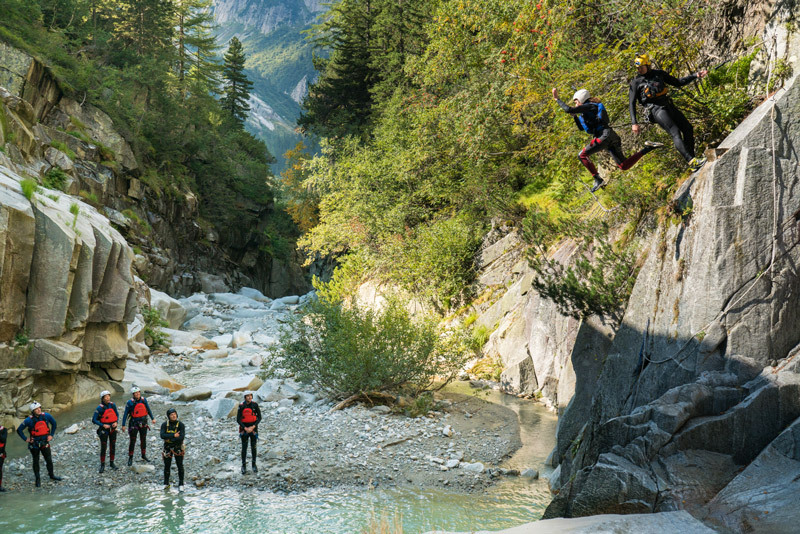 Canyoning in Interlaken is incredible and offers explorers three different options. Across the three canyons, you will find narrow gorges, significant drops, large rock faces, and lots of incredible waterfalls. They range from very easy to challenging. 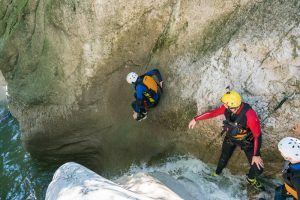 The following gear is used for Canyoning in Interlaken. 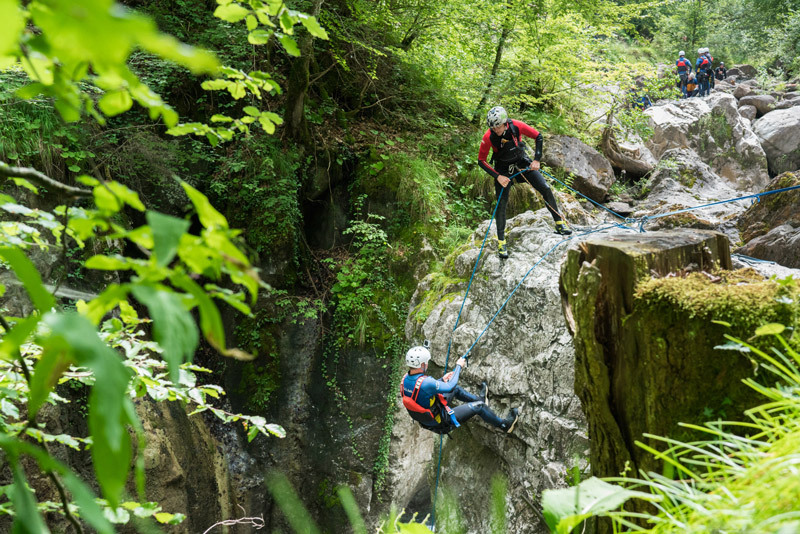 First of all, the local Interlaken canyon covers every aspect of the sport and makes a great introduction to canyoning. 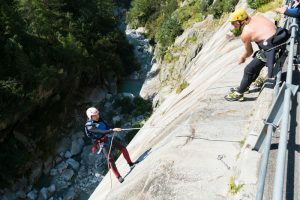 After a short 5 minute drive from Interlaken, the trip starts with a 10m (33ft) rappel followed by several jumps and slides. The highest jump is 5m (15ft) but there is an easy alternative if you’re not up for it. The other jumps are between 1m (3ft) and 2m (6ft) high, and the last slide (the superman) is around 10m (33ft) long. 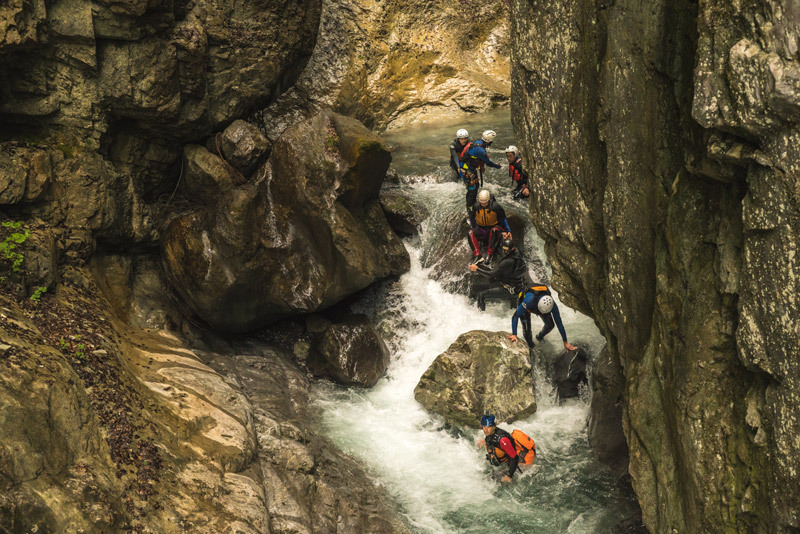 A short walk in the middle gives you time to reflect on what you’ve just done, before entering the second canyon where more jumps and slides await. This half day canyoning experience is a great, easy canyon suitable for anyone, but it still offers enough challenges for those looking for an adrenaline kick. Grimsel Canyon is one level up from Canyoning Interlaken but is also suitable for anyone to join. 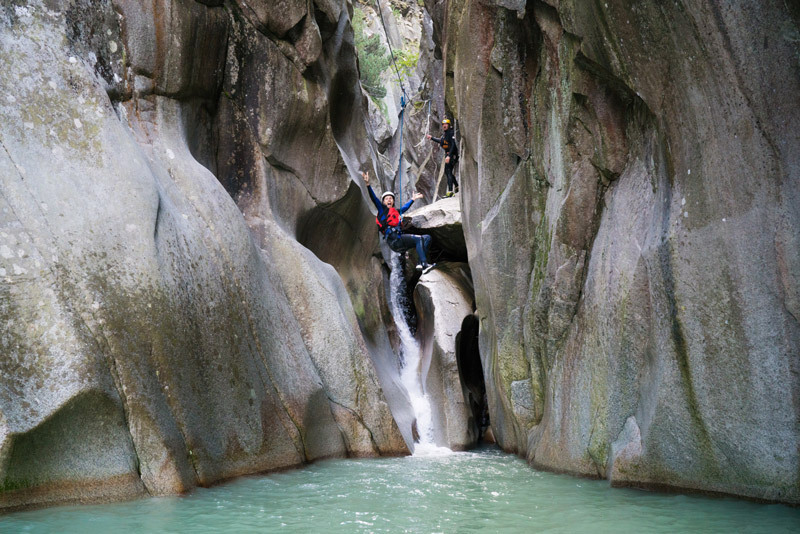 This canyon is different because it is set on a mountain pass and starts with a heart pumping 50m (165 ft) rappel. 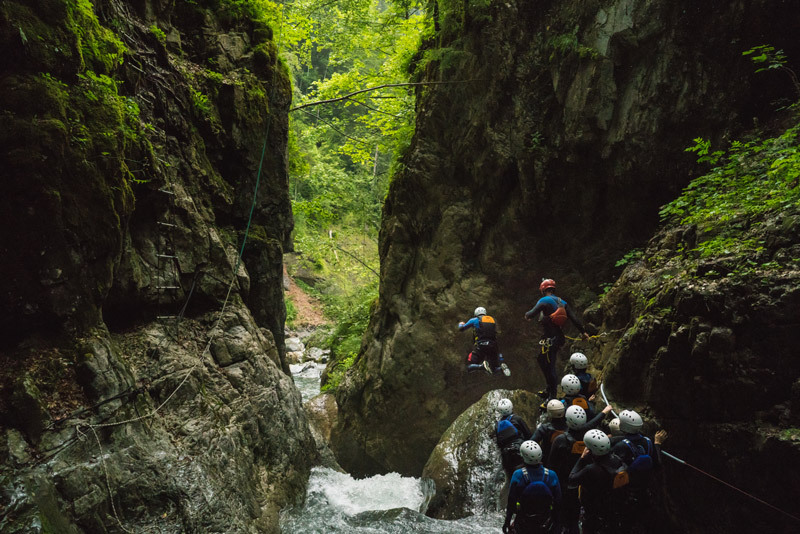 This is the only way into the canyon so be prepared to face your fear of heights ! 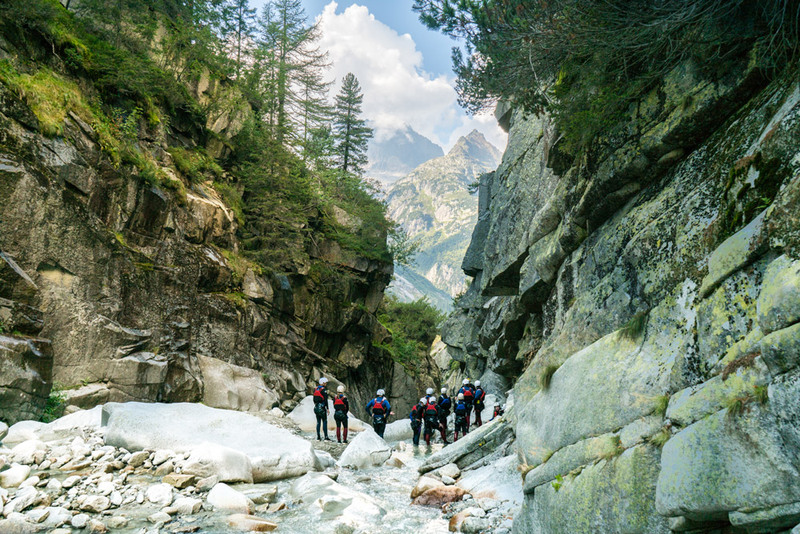 Grimsel canyon is quite wide and open at the start where you begin with a few easy jumps and slides. In the middle is an optional 8m (26ft) jump or and easier 4m (13ft) jump or 4m (13ft) slide. with a release and then land in the crystal clear water below. 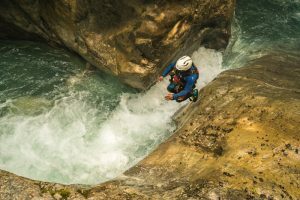 This trip is about 1 hr drive from Interlaken and offers spectacular mountain scenery as a backdrop to your canyoning experience. The best of the best, Chli Schliere takes canyoning to the ultimate level. 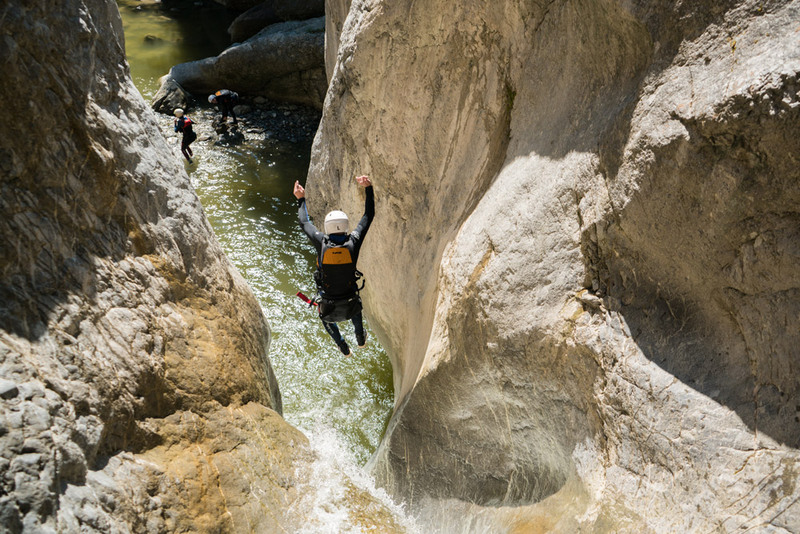 This canyon has high rappels, big jumps, fast slides and is considered the best in the region. 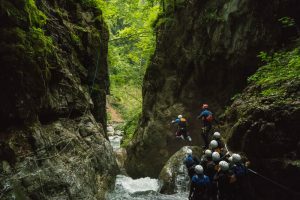 Chli Schliere is a physically demanding and technical canyon with a high adrenaline factor. Chli Schliere is a 1-hour drive from Interlaken and after a 20-minute walk to the start of the canyon, you will begin with one of the biggest jumps of the day! 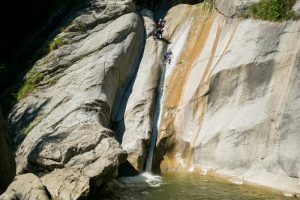 From the start, you are immediately enclosed inside towering vertical walls as each pool leads immediately to the next jump or slide. ​There are ​multiple jumps up to 10m (30ft) ​and there are ​many ​fast slides​. Some are vertical and​ ​others as long as 15m (45ft)​. 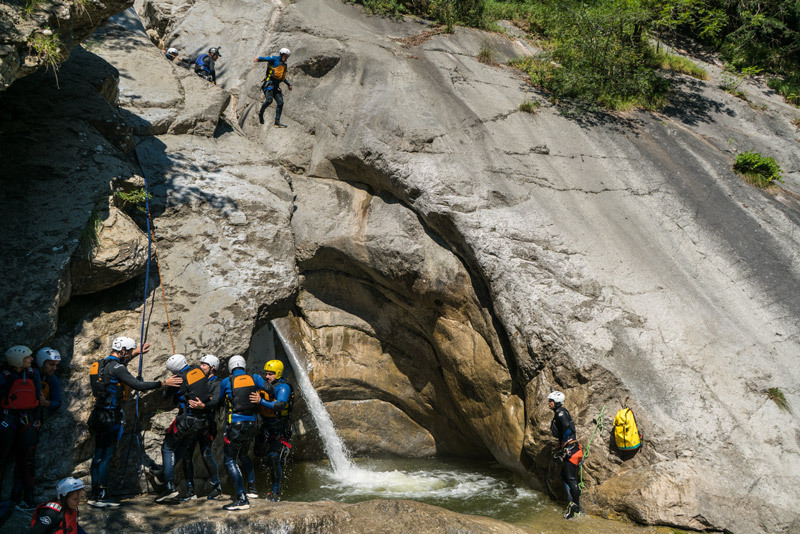 Be prepared for the famous Jump Slide and the waterfall rappel of 20m (65ft)! This is nature’s ultimate water park and designed to thrill. There is a short walking section in the middle where you can catch your breath, but the rest of the trip flows with a high intensity. For this reason, C​hli Schliere​ is suitable for confident, athletic people who ​are comfortable with big jumps and ​want to be challenged. The end of the trip involves a 20-minute walk down the river bed to where a light lunch and a well-earned cold beer awaits!